Basement flooding is not a rare problem. Due to its location, the basement is very likely to be flooded during rainy seasons. This fact is especially true when the amount of rain is exceptional during storms and hurricanes. A sump pump is your first line of defense against basement flooding. Whether caused by water intrusion or by	a sewer backup, a basement flood can be prevented if your sump pump functions properly. A sump pump is a mechanical device used to move liquids for drainage purposes. 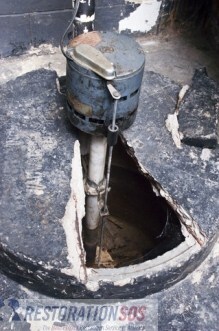 A sump pump will remove accumulated water from a sump pit. A sump pit is often found in the home's basement, and it is simply a hole in the ground in order to collect water. Sump pumps are usually wired into the electrical system. Some sump pumps may have a battery backup and some use the home's pressurized water supply to generate required power, saving on electricity costs and assuring proper functioning even when power is down. In order to properly function, sump pumps must be maintained every 4 or 5 years. Some areas are considered less sump pump friendly and a more frequent maintenance is required. For example: Sandy or muddy areas or areas that are often flooded, requires your pump runs often, or are considered high pump risk areas then an annual maintenance is recommended. When servicing your sump pump, your main goal is to clean the pump and clear out dirt, gravel, and sand. These elements are carried in by the water and can accumulate in different parts of the pump. The existence of these elements shortens the life of the pump and can lead to unwanted jams that are usually detected when the pump is needed the most - during a flood. Accumulation of dirt can reduce the efficiency of the pump and can also burn out the pump completely. Run the sump pump to make sure it works. Try to drain as much water as possible. Unplug the sump pump to prevent electrocution. Disconnect the pipe below the check valve using a screwdriver and lift the sump pump out of the pit. Have a small garbage can handy. Hold it under the check valve and press up with your finger or a screwdriver to drain the water into the garbage can. Disconnect the top of the check valve, remove it and wash it under running water. Use a small plastic cup to scoop up dirt from the bottom of the sump into a garbage can. Clean all the dirt out of the sump pit. Install the pump back into the clean sump, reconnect all pipes, and make sure the float has free motion to lift up so the pump can turn on. Plug the pump back in and test it by lifting the float, or by filling the sump with water from a hose.